Geography can serve to connect people or to keep them separated. The great civilizations developed along river valleys, and great trading nations took advantage of the seas. Those peoples who did not have access to waterways developed their societies at a different pace. Mountain ranges and deserts tend to isolate peoples. The cultures of such people tend to become unique as compared to others who can make contact more easily. This brings us to Appalachia. Appalachia extends from lower New York State to the deep South along the Appalachian Mountain range. 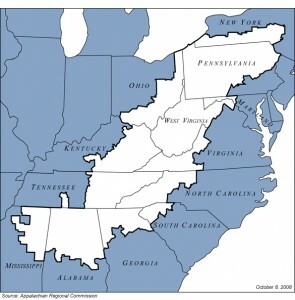 Because of the overall isolation of the region people in Appalachia became self reliant and trusted in each other. Outsiders are viewed with initial suspicion. “A Country Boy Can Survive” – Hank Williams Jr.